Product #15819 | SKU SMARTLAV-CARDIOID12m | 0.0 (no ratings yet) Thanks for your rating! A miniature electret tie clip microphone that is compatible with all Apple iPod, iPhone & iPad devices. Also compatible with Samsung, Nokia, Blackberry, HTC & Sony Smartphones with a 3.5mm headset socket. Very useful for recording meetings / seminars without having to hold your iPod / phone in your hand all the time. It has become very popular for improving the audio on video recording apps where the subject is too far from the internal microphone. This miniature microphone is only 6mm in diameter making it one of the smallest microphones available. It is the most popular microphone of it's kind with a sensitive pick up range & high quality sound at a very good price. A high quality nickel plated TRRS 4 pin jack plug that connects into the microphone (MIC/EARPHONE) socket on your device. 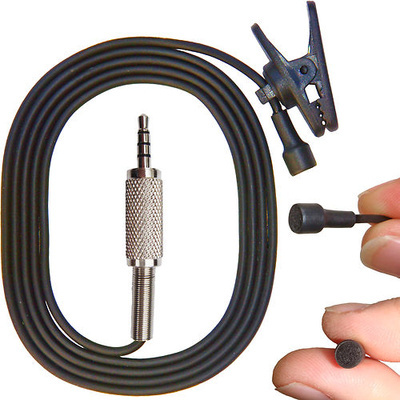 The flexible microphone lead is available in 1,2,4,6,8,10,12,15,20,25,30 metre length's. It is also available with a UPGRADED cardioid unidirectional microphone for an additional $15.00. Please read information below about the unidirectional cardioid microphones. The cardioid microphone is so named because of its pattern of sensitivity, which is roughly shaped like a heart when drawn out on an axis. This means most of the sound a cardioid microphone picks up comes from the front of the mic, while minimal noise is picked up from the rear and only marginal noise is picked up from the sides. This type of sensitivity pattern makes the cardioid microphone useful in a myriad of situations, including but not limited to situations in which several mics are being used at the same time, live performances, interviewing acting e.t.c. The cardioid microphone is designed to pick up one sound well, with other ambient noises fading into the background. A cardioid microphone is particularly useful for live sound recording, such as concerts. It can also be used as a vocal mic for presentations, public address, and other situations that require a vocal mic. The cardioid microphone is also a good choice for recording concentrated sounds such as singing vocals and instruments. Other situations in which a cardioid microphone may be used include household applications, such as online chat (skype, msn etc). The microphone picks up primarily the speaker's voice while eliminating other ambient noise, such as background conversation & television.